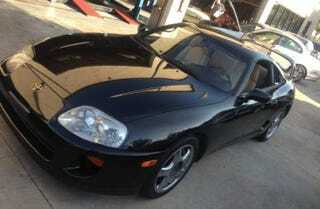 Could This Be The Perfect MKIV Supra You Have Been Searching For? With its legendary twin-turbo 2JZ inline-six, the Mark IV Toyota Supra was quick out of the box, and could also make supercar smashing power with a few mods. But finding bone stock cars in good condition can be a challenge. Is this 60,000 mile, 6-speed, targa the one? Many of us fantasize about a weekend car for cruising, canyon carving, or attacking our local race track. A car that throws practicality aside for pure driving enjoyment. Car Buying has scoured the internet to find a ride for your perfect Sunday Drive! There may be cheaper Supras, there may be ones with less miles, but finding clean examples that are both turbo and manual, with no mods and a targa top are becoming increasingly rare.